Whether for stationary integration or for mobile use, BOLZ INTEC produces stainless steel agitator vessels in all possible sizes and designs -and has done for decades. 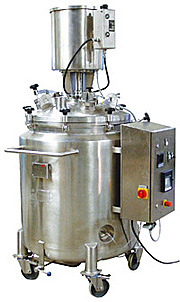 BOLZ INTEC plans and produces agitator vessels according to individual customer requirements specially for the pharmaceutical and chemical industries - application-specific, product-oriented and with maximum surface qualities. Ask us for details. We wolud be pleased to advise you and prepare an offer.